At MJM, our team wears many hats while completing the diverse client projects; we fulfill the roles of designers, writers, storytellers, experience makers, account managers, videographers, carpenters, and many more. But last October, our team members took on a hat never worn before: Formula One Race Car Drivers. 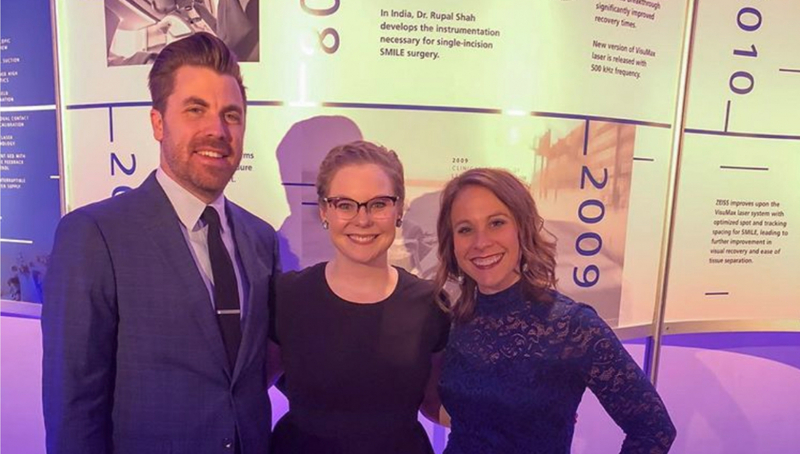 Working with our partners at ZEISS, Logan, Abby, and Courtney took the lead for planning and executing an event celebrating the FDA approval of the SMILE astigmatism treatment indication in the United States at the American Academy of Ophthalmologists (AAO). 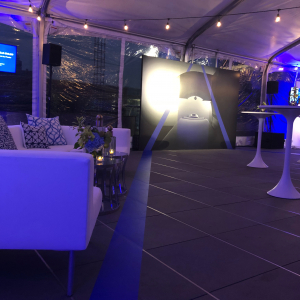 Using a Formula One theme, the MJM team was able to create a wonderful evening of education, conversation, and enjoyment on a beautiful rooftop in Chicago. Logistics are very, very important! 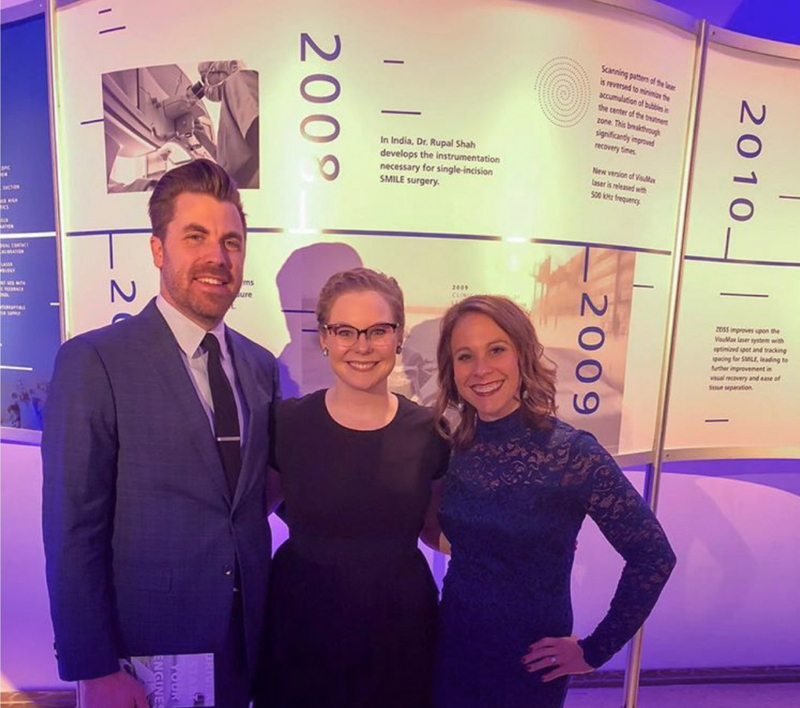 This event celebrated the approval of the SMILE laser in the US for astigmatism treatment, which makes it a more useful technology for practices and more accessible to patients. SMILE is one of the first major innovations in refractive eye surgery in the past 5-10 years, which has brought energy and life to the doctors who are deciding to offer it. Our partnership with ZEISS started when we helped create the first practice launch kit for SMILE, and the partnership continued as we helped curate and design this event. After moodboards, strategic goal discussions, MJM team brainstorming sessions, and dozens of calls, the event landed on a theme: Formula One Racing. Courtney poses as a driver. 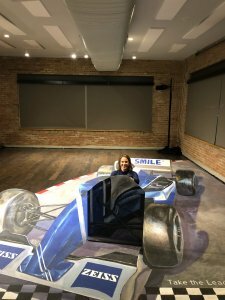 The account team found a Chicago chalk artist who created a massive perspective drawing that put attendees behind the wheel of a F1 racing car. Our team developed all the graphics and layouts based on the theme and curated a three-floor immersive event experience, which included specialty cocktails and an interactive art installation. At the event, doctors attended six “pit stops”, where they interacted with a short presentation from an expert on SMILE, and were eventually lead to Dr. Dan Reinstein, a doctor and professor who wrote the first and preeminent textbook on how to perform SMILE for patients. Attendees who completed all the education pit stops had the opportunity to receive a signed copy of Dr. Reinstein’s textbook to take home to their practice. The valuable takeaway is this: when your event marketing team is able to be a part of the planning, mockups, mood board, and event execution, it’s more efficient to facilitate coordination with the vendors. It took a full team to perfectly produce the event, which illustrates the importance of coordinated effort, time, and planning. Of course, we admit this event didn’t go off without a hitch (or three). From a change of speaker the night before, all the way to Logan putting his Exacto-knife skills to the test due to a mishap with program printing, the team encountered a number of unplanned hurdles that needed to be overcome. The event was spread between three floors of the venue. 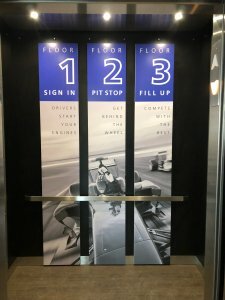 Custom elevator signage helped theme each step of the way and direct event attendees to food, entertainment and education. We also know there are peak experiences that are remembered far beyond any mishaps. As the attendees started arriving and moving from experience to experience at the event, they began to discover, enjoy, and be captivated by all of the small details created by our team. Meeting new people, interacting with the art, enjoying the signature cocktails, and learning new things achieved success beyond what our team had planned. These signature moments, and the culmination of all the moments into a signature experience, will be a lasting memory and takeaway for both the ZEISS and MJM teams.Beyond the night of the event, the work our team did to pull off the theme and overall event was extensive. The theming, attention to detail, venue, and overall event flow, and outcome were executed carefully and with high attention to detail. Members from our team also traveled to Chicago before the event to meet with vendors face-to-face because we understand how important it is to create those relationships in case we do need to call on them to overcome challenges on the night of the event. Each experience we curated was met with an experiment on how to accomplish it. When you work with clients that are excited about their company, it makes throwing an event that much more successful. The time that went into planning with ZEISS was met with excitement and enthusiasm that their product had been approved. ZEISS challenged us to immerse their audience in something more than just a traditional AAO event or brochure handout, so we designed a custom experience for their guests, including hiring a local street artist to create a race car photo opportunity right in the middle of the building. We wanted to share our love for experiences and make the ophthalmologists feel welcome and feel comfortable learning about the revolutionary procedure in a simple and organized way. It wasn’t just about the centerpieces and the lighting—it was about the guests that left and remembered why they were there and knew there was something worth celebrating that night. It’s important to celebrate major innovations and milestones in product development. It’s good for the industry and good for patients. Events like this are one of the only times ZEISS can bring doctors together and immerse them in a brand experience. So much of their sales cycle involves going out to the doctor’s office, where they have no real control of the time, space, and environment. This event was a major opportunity to bring doctors together and shape the ZEISS brand experience, with full control of most of the details. MJM was proud to be a lead partner in building the experience. A ZEISS blue racing stripe runs through the venue helping to direct traffic and pull the theme together. As we reflect on our experience through this event, we learned there is a major difference between just hosting an event and designing an event. We design and theme at MJM to use our knowledge of experience design and customer/client psychology. This event reminded us that every company, every product, and every type of customer deserves and loves to be delighted and surprised by a well-executed event. That’s why we love what we do at MJM. MJM and ZEISS will continue partnering on projects in 2019 and beyond. Anna is an intern at MJM.